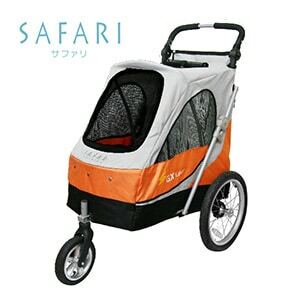 3 wheel buggy – Safari is made for a big size dog or a multiple small/medium size dogs. Strong quality tires make the buggy stable. 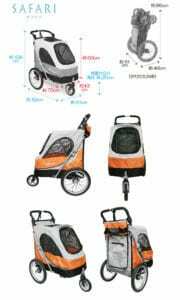 A flexible front wheel makes it easy to maneuver. 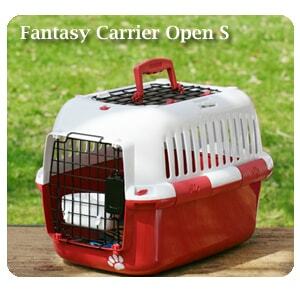 A rear entrance opens wide with a zipper so that an even big size dog can enter easily. Reflective tapes are located under the rear entrance and tires to improve visibility. A stopper of the rear wheel for easy parking. 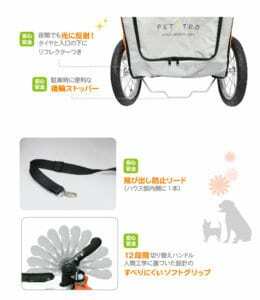 A lead is located in the buggy to keep a dog inside. A big front window with mesh cloth cover a view and breathability. 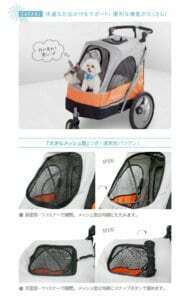 The front mesh cover can be attached with a zipper and can be folded to stored inside of the buggy. The top mesh cover also can be rolled up and snapped on the top. 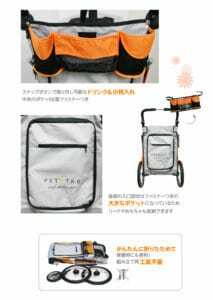 The drink and item holder can be attached on the back of the buggy with snap buttons. The rear door flap can be fasten with a zipper. It also has a big pocket to store items like a lead or a toy. It is easy to fold and disassemble without a tool.